The effectiveness of animal therapy programs for veterans with PTSD, or post-traumatic stress disorder, enables increasing numbers of U.S. veterans to get the help they need to deal with the physical and psychological impairments stemming from their military service. PTSD is considered to be a type of anxiety disorder, and typically develops after a person experiences a traumatic event that involved physical harm or the threat of physical harm. It is particularly common among military veterans, and was once referred to as shell-shock or battle fatigue syndrome. H4HUS, an organization that offers equine-assisted and canine-assisted therapy for military veterans, has announced the addition of a mental health component in all of its programs. H4HUS is based in Bedford, N.Y., and conducts its programs at the Therapeutic Equestrian Center in Cold Spring, N.Y. and at Gossamer Pond Farms in Cameron, N.C.
H4HUS targets its services to veterans who have completed service or cannot return to service due to medical reasons, and to active service members who are between tours. All programs are provided free of charge. Through H4HUS, veterans are introduced to dogs that have been rescued from kill shelters, or horses that have been abandoned or repurposed. After the animals are evaluated, desensitized and educated by professional trainers, they are matched with veterans based on their individual needs. The equine and canine therapy programs establish goals for the participants to solve problems, build teams and relationships, learn to complete specific tasks, or simply increase confidence and renew an individual’s self-esteem. Conducting animal therapy programs for veterans with PTSD offers them opportunities to work through life challenges metaphorically. These programs include handling horses on the ground, grooming school, equine assisted riding, therapeutic driving, and combined (or team) driving. “One of the keys in working with our veterans is to understand that PTSD is something that happens to you,” said Burns. “Veterans come from a background where they believe they can do everything for themselves, and that there’s nobody back home who truly understands them or what they’ve been through. H4HUS programs and its volunteers use the Equine Assisted Learning (EAL) and Equine Assisted Growth and Learning Association (EAGALA) models. Such certification ensures that training is established for non-verbal communication, problem solving, taking responsibility, relationship building and teamwork, and Equine Assisted Psychotherapy (EAP). H4HUS also provides canine-assisted therapy programs through which veterans work with trained dogs to complete obedience testing, obstacle courses and confidence building tasks. Mental health professionals supervise these programs. Being able to give a command to a trained dog empowers the veteran to know they are listened to and empowers the veteran’s relationship-building skills. In addition, certified therapy dogs and their handlers visit veterans’ hospitals to work with individuals who are unable to leave due to injury or for mental health reasons. Burns founded H4HUS in 2013 as a 501(c)(3) non-profit organization, and the agency is actively seeking corporate, foundation and individual donations to support its efforts to serve America’s military veterans. For more information, or to make a donation, contact Burns at (914) 433-1505 or visit http://www.h4hus.org. 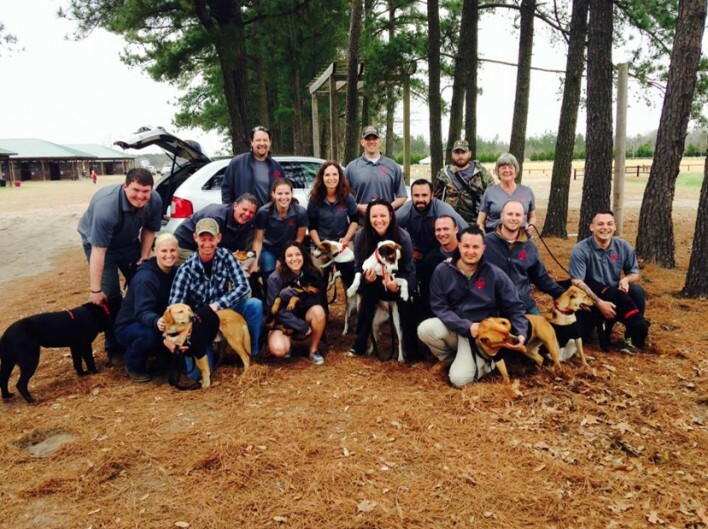 H4HUS (Hearts 4 Heroes United States) assists military veterans with the process of re-acclimation to life back home through participation in therapeutic canine and equine programs. H4HUS is a non-profit organization and provides free programs that introduce veterans to horses and dogs that are in need, creating a bond of mutual and lasting support. The organization maintains a web site at http://www.h4hus.org.